O Donovan Engineering have four full-time sales people on the road daily who meet and work with customers nationwide. 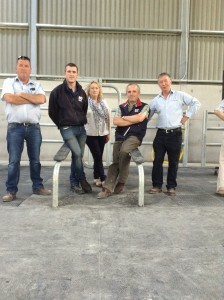 Sales representatives for the firm, Dermot Donovan, Vincent Dorney, John Finnegan and Charles Kenneally have almost 100 years of experience combined working directly with customers to design custom housing and handling solutions in the dairy, beef, sheep and pig sectors. “No two farms are the same and what works in one yard may not work in another” explains Vincent. Over the last 35 years O’ Donovan Engineering have seen the good, the bad and the ugly and this is why we believe in the importance of putting time and effort into the planning of any project. Dermot Donovan, is a brother of company founder Damien O’ Donovan and joined the company in 1983. A short time later Vincent Dorney joined the company in 1984 where he began in production and is now area sales manager. John Finnegan joined the team in 1995 as production supervisor and progressed to sales a short time later. Charles Kenneally is the newest member to the team who joined us two years ago. All the sales team are experts in their field and all excel in different areas. John is our in-house sales man who will always be here to meet you and answer any queries you may have, he may even give you a cup of tea and biscuits (if he can find one of the girls to make it). Vincent and Charles are the sales men that are almost full time on the road meeting customers and doing site visits. Dermot on the other hand has the best of both worlds where he splits his time between the office and the road equally, which can be very demanding during busy seasons.